Let US Find You the Ideal Sportfisher! Let Us Sell your Sportfish! Welcome to our Sport Fishing Yachts Buyer Knowledge Center. 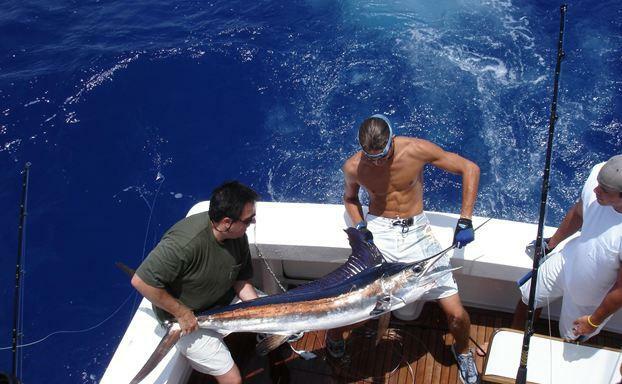 Check out our customized searches for all varieties of sport fishing yachts for sale! The term, ‘Sport Fishing’ yachts explains it all! Sport fishing yachts are designed to catch fish! Sport fishing yachts (also known as sport fishers or sport fisherman) are extremely popular with game fishers and divers worldwide. Here on the Southeast US coast, sport fisher yachts typically stay in Florida to fish around South Florida and the Florida Keys. Quite often, these sportfishers make their way to the active fishing grounds in the Bahamas. The Bahamas are easily cruised to any time of the year and feature a wide variety of different fishing tournaments. Bimini is the most western Bahamian island and located only 50 miles from South Florida, offering world class fishing opportunities for pelagic species such as marlin, wahoo, sailfish, dolphin (mahi mahi), tuna and more. Steep drop offs provide many fishermen with opportunities to catch bottom dwelling fish such as grouper, snapper, tilefish, swordfish and more deep water species which serve well at the dinner table. Sport fishing yachts also double as diving platforms for spearfishing. Blue water spearfishing (that is in deep water) is becoming a very popular sport activity for divers to spear pelagic species. Most sport fishing yachts on the US east coast are designed to be fast and equipped with a fly bridge plan including a helm offering good 360 degree visibility, extra seating and an enclosure. Since a large cockpit is essential to catching fish, the operator must have great visibility and access to the cockpit. Accommodations often include luxury yacht staterooms for owners and guests located forward of the salon and galley area. Often a crew area is provided near the engine room. Speed is essential for covering vast amounts of ocean while on the hunt, thus large diesel engines or multiple outboard engines and light hulls are the norm, especially in the Southeast US area. Other areas such as the West US coast rely on range to get to popular fishing grounds and thus smaller engines with more fuel capacity. Express sport fishing boats which are one level, yet still offer a smaller salon and cabin area. Tower configurations offer the ability to spot fish action according to the area and types of fishing. Towers are made from aluminum tubing and offer a range of styles from half towers, marlin towers and tuna towers (the tallest). All sport fishing yachts are equipped with outriggers for trolling multiple baits. Some sportfishers opt to install deep-dropping equipment such as down riggers and electric reel stations. Plenty of rod holders are positioned for easy access and multiple types of rods. Yacht fishers are also popular as they combine the best of the sport fishing boat cockpit and aft deck; yet the comfort and amenities found in motor yachts. Yacht fishers are extremely popular on the US west coast where range is a big consideration. Speaking of range, a growing trend are ‘mother ships’ which can explore remote areas of the world and carry fast sport fishers on the deck. These expedition style yachts can launch and retrieve these sportfishing boats when they reach their destinations. The big Three sport fish builders are Viking, Bertram, Hatteras – all built in the US. These boats are production built and are equipped for speed and luxury – often with enclosed fly bridges. North Carolina and Florida regions are noted for customized, high end tournament and charter sport fishers. These sport fishing yachts are crafted from a process called “cold moulding” (epoxy laminated wood). American Custom, Blackwell, Ricky Scarborough, Buddy Davis, Craig Blackwell, Jarrett Bay, Hines Farley, Garlington and Monterey are some of the notable builders. Captain Jay Cohen is our resident expert on sport fishing and sport fishing boats. Jay owns a charter company, Reel Adventures, with the “Spellbound” in Haulover, Florida. Jay can not only share plenty of hands-on knowledge for catching fish, but also give you the best advice and assistance for finding the right used sport fishing boat for your needs! Sport Fishing Yachts for Sale! 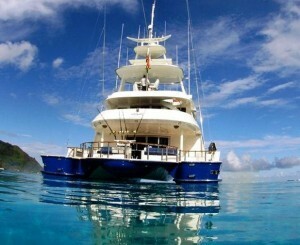 Looking to purchase a sport fishing yacht? Use our extensive database of new and used sportfishers and sport fishing yachts for sale. Call Andy Kniffin (954) 889-7330 or email directly to info@akyachts.com for a custom search (including sport fishers which may not be actively on the market) tailored to your needs and requirements! Not finding the perfect sportfisherman for sale? Click Here to use our advanced search tool so you can refine your search for the ideal yacht!